Spending your entire life away from your native country is a big challenge in itself. No matter for how many years you stay abroad or how well established your residing country is India has its own fascination. When it comes to the Real Estate Sector; it is doing stupendously well all over the country. Linked to our earlier article of the rupee losing steam, now is the time to get more bang for your buck! You have seen all the scams, you have seen the great growth (GDP or otherwise), and they tear you. You want to invest in this great country called India, but all the scams you have heard of and experienced scare you. After all it’s your hard earned money; you must do a double check and ensure, to get full worth of your investment. Focus on the five W’s while choosing your dream home in India. Who Your first and foremost step should be to conduct a thorough survey of the market before settling on a builder. Look for builders’ reputation in the market, on time delivery of the project, quality of construction and delivery of the promises made including amenities, security and other facilities. Ensure that your builder prices are not very high when compared to the market price. Why Are you buying a property in India to live with your family, for your parents back home or from an investment point of view? When you decide your purpose then come up with a budget. If you are planning to move in you won’t mind spending a few extra pennies. On the other hand if you are looking for an investment purpose you’ll probably choose the one which will give you higher returns. What Other than the base sale prices there are some additional costs that should be considered. For instance, preferential location charge (PLC), external development charge (EDC), infrastructure development charge (IDC), parking charges, club membership fees, maintenance charges, stamp duty charges, registration charges, legal fees, brokerage fees (if applicable), yearly taxes and more. Where City and location plays a major role in investment. Look for good infrastructure including connectivity to road, rail and air, good growth rate and employment opportunities and also on the quality of life the place will provide. For instance, if you go for Delhi it is divided into North, South, East and West. So you must explore all the divisions before investing. 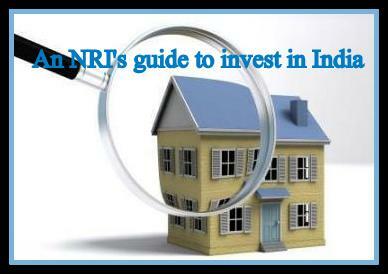 All these factors must be kept in due consideration while buying a property in India. When A market can never be stable for long. It keeps changing in a good or bad way depending on the economy any many other factors. Call up your friends or hire a professional who works for you rather than for himself (US!!) to give you the latest information and guide you through out the investment process. He’ll make you invest at the right time and will surely come up with the best location. a) The booking amount for the property is between 10 to 15% of the base sale price and it can be done through wire transfer or INR from any established NRE/NRO accounts maintained with banks in India. b) There are two plans for payment, down payment plan and linked plan. Down payment plan: Buyers pay 85% of the total sale price within 30 to 60 days of booking and the remaining 5% at closing. In this plan the buyer is given a substantial discount as a means of incentive for paying in advance. Linked plan: The payments are made in installments during different stages of construction. In this type of payment the capital is not blocked due to delays in construction. c) If you are going for a bank loan- there are many banks offering home loans like State Bank of India, ICICI, Kotak, HDFC etc. The borrower should be able to pay 30% of the cost of the property by himself/herself and the term amount does not exceed 15 years. Initially the rate is quite low as 8% but eventually after a year the rates can rise to 9.75%. d) You can assign power of attorney to someone in India and they can sign the papers at the time of property possession and registration. a) You can purchase any immovable property (residential or commercial) in India other than an agricultural land, farm house or a plantation property. b) You can get any immovable property by gift from Indian resident, Indian citizen residing outside India or person of Indian origin. c) You are eligible to buy a property in India only if you have an Indian passport, either of your parents or grandparents were Indian citizens or you are married to an Indian citizen. d) You can transfer any agricultural land, farm house or plantation land to any resident of India by gift. e) You can also transfer your residential or commercial property by means of gift to any person either residing in India or abroad or person of Indian origin. f) You will have to pay the applicable tax if you are residing in a country where worldwide income is taxable unless the country has Double Tax Avoidance Agreement with India. You are legally responsible for the payment of capital gains tax as prescribed under the Income Tax Act, in case you sell off the property. We will cover the tax implications in our next article. website came up, it seems to be great. I’ve bookmarked it in my google bookmarks.